It is significant that this feast is celebrated on the day before the Apodosis of the Feast of the Elevation of the Holy Cross, since it was the Cross of Christ, in a miraculous manner, which inspired the conversion of the great early 2nd century martyr St. Eustathios from paganism. This is reflected in the hymn of St. Nikolai Velimirovich which I posted toward the end, followed by his life. 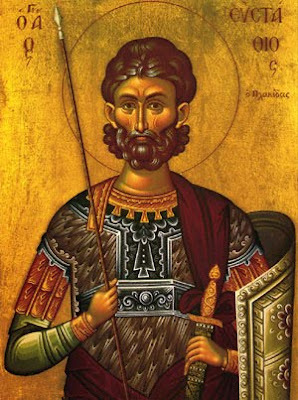 The Holy Great Martyr Eustathios was named Plakidas before his Baptism. He was a military commander under the emperors Titus (79-81) and Trajan (98-117). Even before he came to know Christ, Plakidas performed acts of charity, helping the poor and destitute. Therefore, the Lord did not leave the virtuous pagan to remain in the darkness of idolatry. 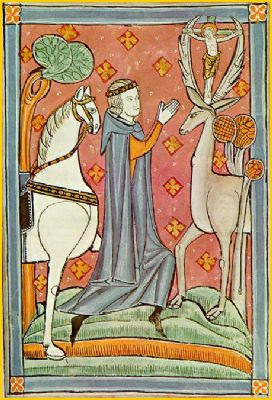 Once while hunting in a forest, he saw a stag which would stop now and then to look him right in the eye. Plakidas pursued it on horseback, but could not catch up. The stag leaped over a chasm and stood on the other side facing him. Plakidas suddenly saw a radiant Cross between its antlers. In surprise the military commander heard a voice coming from the Cross saying, "Why do you pursue Me, Plakidas?" "Who are You, Master?" asked Plakidas. The voice replied, "I am Jesus Christ, whom you do not know, yet you honor Me by your good deeds. I have appeared here on this creature for your sake, to capture you in the net of My love for mankind. It is not fitting that one as righteous as you should worship idols and not know the truth. It was to save mankind that I came into the world." Plakidas cried out, "Lord, I believe that You are the God of heaven and earth, the Creator of all things. Master, teach me what I should do." Again the Lord replied, "Go to the bishop of your country and receive baptism from him, and he will instruct you." Plakidas returned home and joyfully recounted everything to his wife Tatiana. She in turn told him how the evening before, in a mysterious dream, she had been told, "Tomorrow you, your husband and your sons shall come to Me and know that I am the true God." The spouses then proceeded to do as they had been bidden. They hastened to the Christian bishop, who baptized all their family, and communed them with the Holy Mysteries. 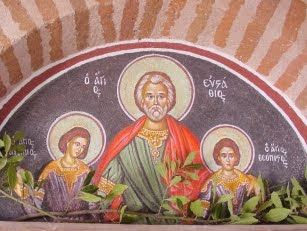 Plakidas was renamed Eustathios, his wife was called Theopiste, and their children, Agapios and Theopistos. On the following day, St. Eustathios set out to the place of his miraculous conversion and in fervent prayer he offered up thanks to the Lord for having called him onto the path of salvation. Again St. Eustathios received a miraculous revelation. The Lord Himself foretold his impending tribulations: "Eustathios, you shall suffer many misfortunes, as did Job, but in the end you will conquer the devil." Soon St. Eustathios was plunged into misfortune: all his servants died of the plague and his cattle perished. Brought to ruin, but not despairing in spirit, St. Eustathios and his family secretly abandoned their home, to live unknown, humble and in poverty. They went to Egypt to board a ship sailing for Jerusalem. During the voyage a new woe beset the saint. The ship owner, enchanted by Theopiste's beauty, cruelly set Eustathios and his children ashore, keeping the wife for himself. In great sorrow the saint continued on his way, and new woe beset him. Coming to a tempestuous river, he went to carry his two sons across in turn. When he had brought one across, the other was seized by a lion and carried off into the wilderness. As he turned back towards the other, a wolf dragged that child into the forest. 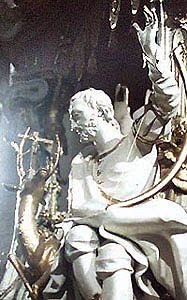 Having lost everything, St. Eustathios wept bitterly, but he realized that Divine Providence had sent him these misfortunes to test his endurance and devotion to God. In his inconsolable grief, St. Eustathios went on farther, prepared for new tribulations. In the village of Badessos he found work and spent five years in unremitting toil. St. Eustathios did not know then that through the mercy of God, shepherds and farmers had saved his sons, and they lived right near him. He also did not know that the impudent shipowner had been struck down with a terrible disease and died, leaving St. Theopiste untouched. She lived in peace and freedom at the place where the ship landed. During this time it had become difficult for the emperor Trajan to raise an army for Rome to deal with a rebellion, for the soldiers would not go into battle without their commander Plakidas. They advised Trajan to send men out to all the cities to look for him. Antiochus and Acacius, friends of Plakidas, sought him in various places. Finally, they arrived in the village where St. Eustathios lived. The soldiers found Eustathios, but they did not recognize him and they began to tell him of the one whom they sought, asking his help and promising a large reward. St. Eustathios, immediately recognized his friends, but did not reveal his identity to them. He borrowed money from one of his friends and fed the visitors. As they looked at him, the travellers noted that he resembled their former commander. When they saw a scar on his shoulder from a deep sword-wound, they realized that it was their friend there before them. They embraced him with tears and told him why they were seeking him. 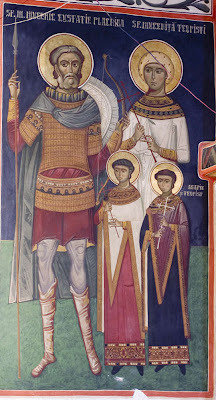 St. Eustathios returned to Rome with them and again became a general. Many new recruits were drafted into the army from all over the empire. He did not know that two young soldiers who served him, and whom he loved for their skill and daring, were actually his own sons. They did not know that they were serving under the command of their own father, nor that they were brothers by birth. While on campaign, the army led by Eustathios halted at a certain settlement. The soldier-brothers were talking in their tent. The elder one spoke about his life, how he had lost his mother and brother, and how in a terrifying way he had been parted from his father. The younger brother then realized that before him was his very own brother, and told him how he had been rescued from the wolf. A woman overheard the soldiers' conversation, since their tent was pitched right next to her house, and this woman realized that these were her sons. Still not identifying herself to them, but not wanting to be separated from them, she went to their commander, St. Eustathios, to ask him to take her to Rome with him. She said she had been a prisoner, and wanted to go home. Then she came to recognize the commander as her husband, and with tears she told him about herself and about the two soldiers who were actually their sons. 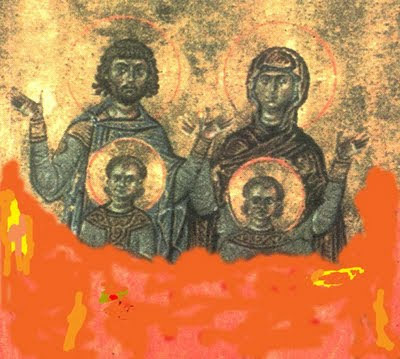 Thus, through the great mercy of the Lord, the whole family was happily reunited. 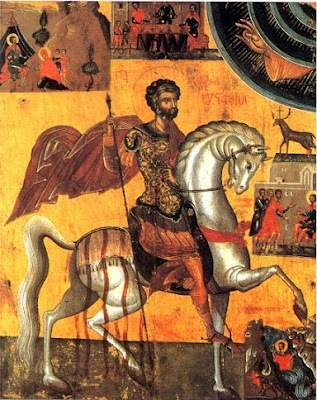 Soon thereafter the rebellion was crushed, and St. Eustathios returned to Rome with honor and glory. The emperor Trajan had since died, and his successor Hadrian (117-138) wanted to celebrate the event of victory with a solemn offering of sacrifice to the gods. To the astonishment of everyone, St. Eustathios did not show up at the pagan temple. By order of the emperor they searched frantically for him. "Why don't you want to worship the gods?" the emperor inquired. "You, above all others, ought to offer thanks to them. They not only preserved you in war and granted you victory, but also they helped you find your wife and children." 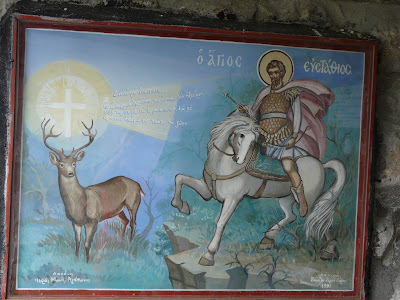 St. Eustathios replied: "I am a Christian and I glorify and give thanks to Him, and I offer sacrifice to Him. I owe my life to Him. I do not know or believe in any other god than Him." In a rage, the emperor ordered him to take off his military belt and brought him and his family before him. They did not succeed in persuading the steadfast confessors of Christ to offer sacrifice to idols. 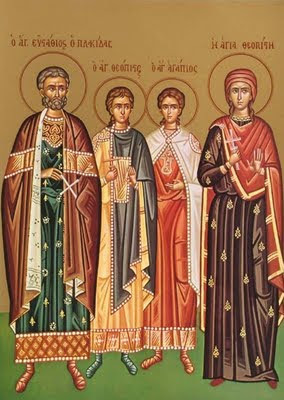 The whole family of St. Eustathios was sentenced to be torn apart by wild beasts, but the beasts would not touch the holy martyrs. Then the cruel emperor gave orders to throw them all alive into a red-hot brass bull, and St. Eustathios, his wife Theopiste, and their sons Agapios and Theopistos endured a martyr's death. 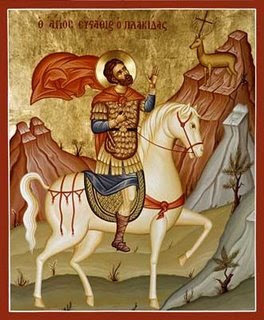 Before being placed in the bull, St. Eustathios prayed, "Grant, O Lord, Thy grace to our relics, and grant to those who call upon us a place in Thy Kingdom. Though they call upon us when they are in danger on a river or on the sea, we entreat Thee to come to their aid." Gave his life for the Living Lord. For the sake of true eternal life. The All-glorious Lover of Mankind. The Cross gave him wondrous fearlessness. And his children, heroic and virtuous. And his blessed spirit to the Lord. That the malicious demon not slander it. And glorify her Sun, Christ. O blest one, since thou didst emulate Christ's sufferings and drankest His cup with eagerness, thou didst become a partaker and joint-heir of His glory, O wise Eustathios; and since He is God of all things, He gave thee divine power from Heaven's heights.